According to the Helio TV ads, calling it a “phone” is a misnomer, and they really don’t want to be compared to other mobile phone providers. Probably the most significant feature that separates this device from the others is it’s integration with MySpace. With Helio, you can do a number of functions to interact with your MySpace account, including post photo bulletins, mail, comments, add friends and more. 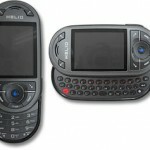 Helio boasts having the only device that is built around interacting with MySpace. 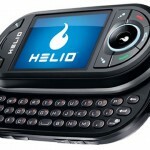 Helio offers something called Speedy 3G that gives high speed internet to the device for getting the “Helio On Top” news streams, surfing, games on a QVGA screen, video and music as well as messaging. Gift and Beg is an interesting feature, were you can either “gift” someone a ring tone, video or game, or you can “beg” for one from someone. At the time of this post there are two devices offered, the Hero and the Kickflip. Both have the same features but slightly different looks (black or white, one slides up and the other cover swivels open), and you can buy per minute plans or a la carte memberships. The one thing to watch currently is where the coverage is for all the features. If you simply want to talk (even though this is not a phone) you can go almost any where in the continental US. If you want any of the other features aside from talking, the coverage is still pretty limited to metro areas.